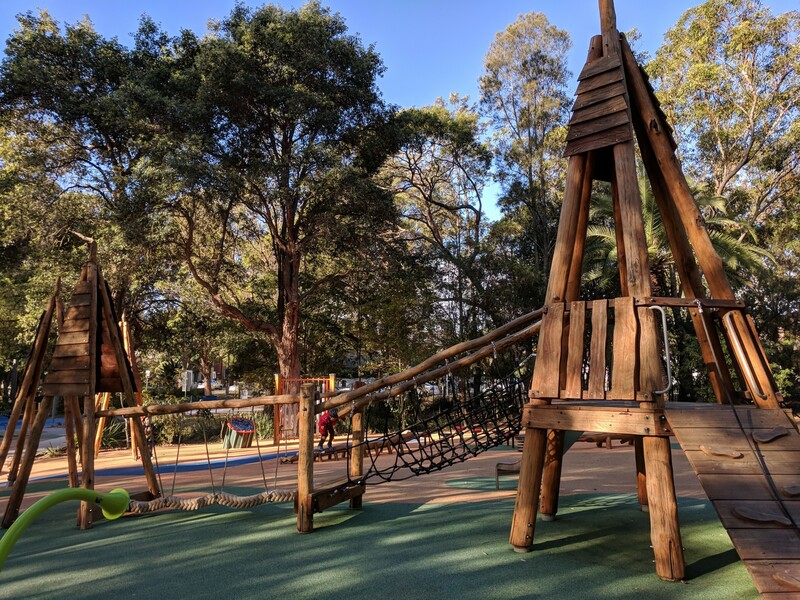 WOW oh WOW....Strathfield Park ticks almost every box when it comes to a great, large playground for hours and hours of fun, year round and for kids of a range of ages and abilities! 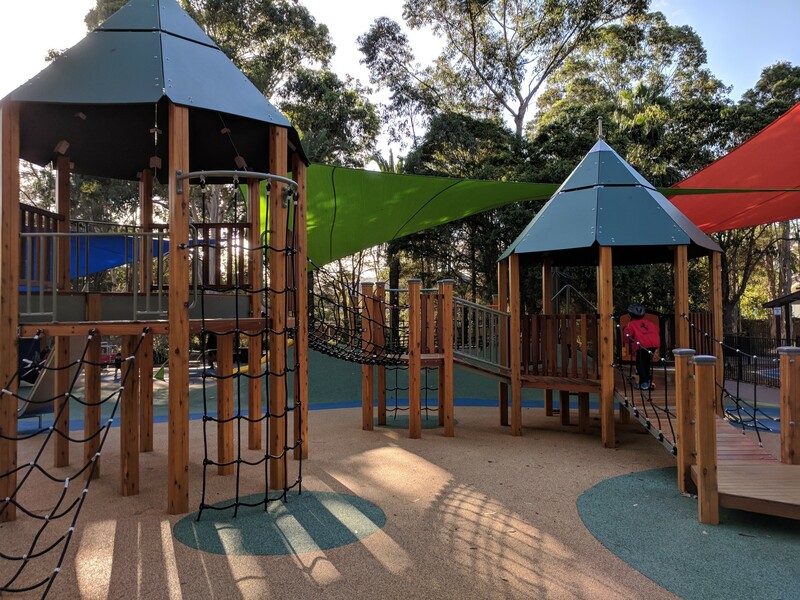 If there was an award for the best playground in Sydney’s west as voted by families, we think Strathfield Park would be a top contender! 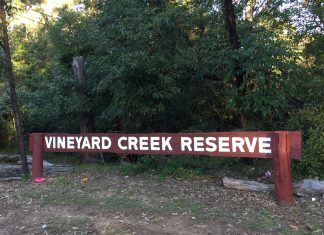 We have been a number of times since it re-opened in September 2017, and it would definitely get my vote at the moment. 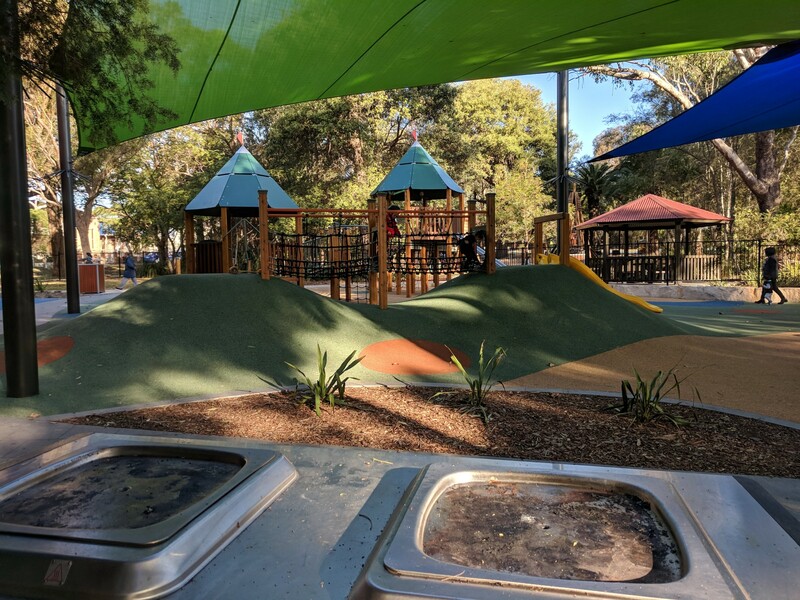 There are just so many fun play spaces, such variety of play equipment, thrills for kids of different ages and great facilities. 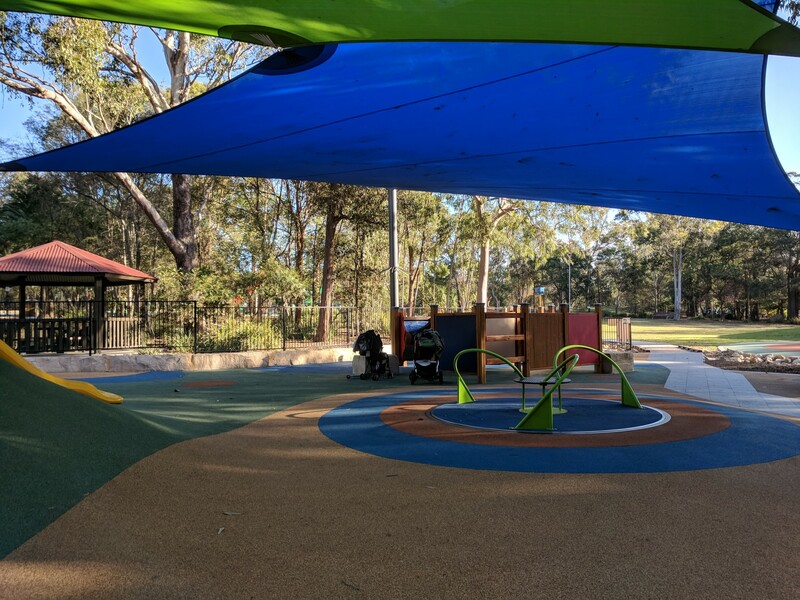 While Strathfield Park ticks a lot of boxes, it is though missing a baby change table, water play and cafe. 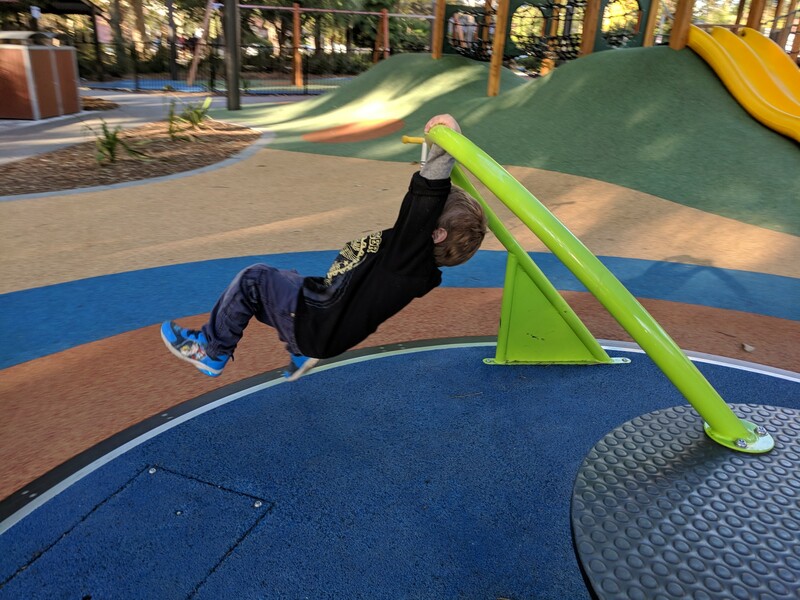 But it makes up for those with a fab scooter/ bike track, nature based play, big slides, flying foxes, toilets, shade, BBQs, sports fields, picnic shelters, inclusive play equipment, musical instruments and much more. Plus there is a coffee van that visits on weekends! Keep in mind that there is no fencing along the roads, but there is landscaping that creates a barrier in most places. 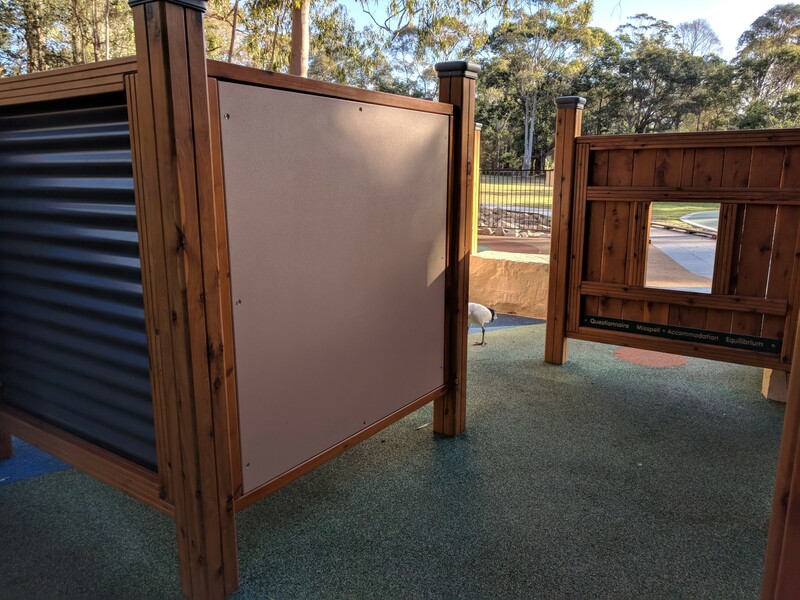 The entrance near the toddler play area could do with a fence/ gate though for some extra piece of mind with little ones. 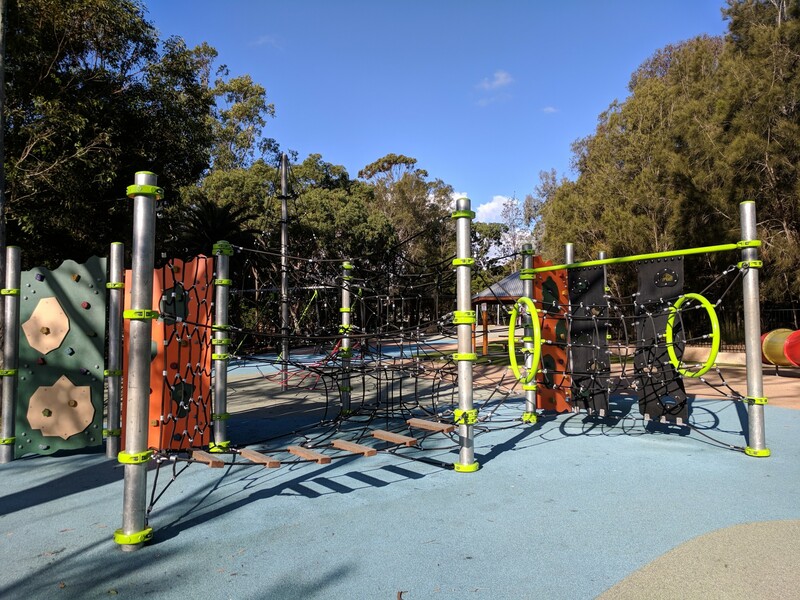 All up we count about 10 play areas within Strathfield Park! 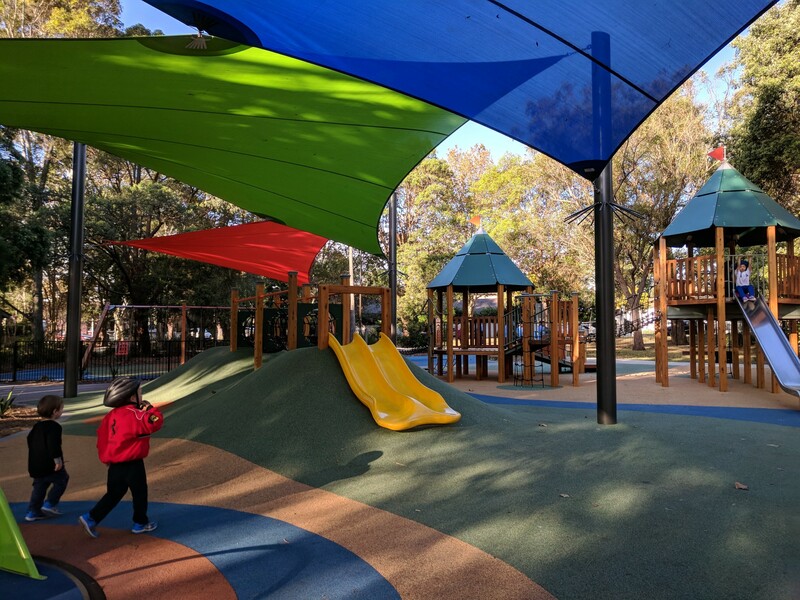 The play areas are mostly located on either the Chalmers Road side or Homebush Road side, with the sports fields and toilets sort of in the middle. 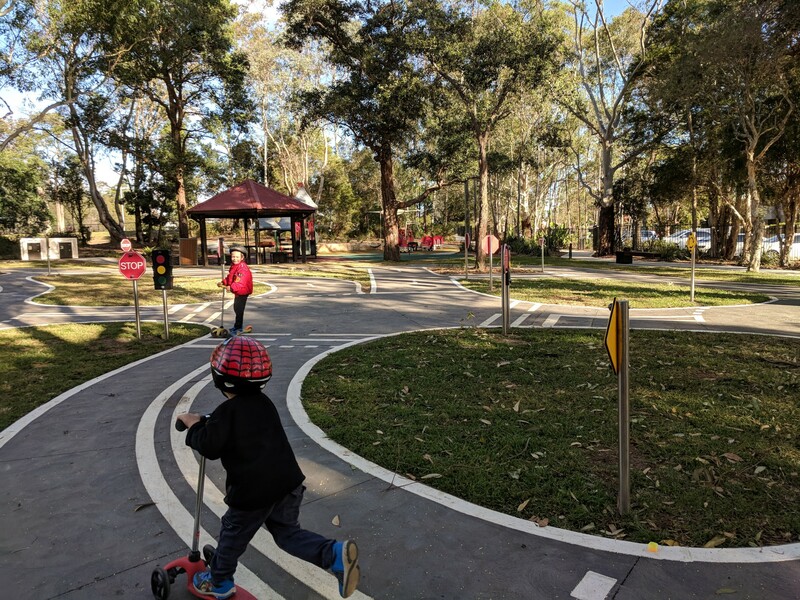 Makes it hard to pick one photo or video to capture the whole playground – but the new scooter/ bike track is a BIG highlight for us. 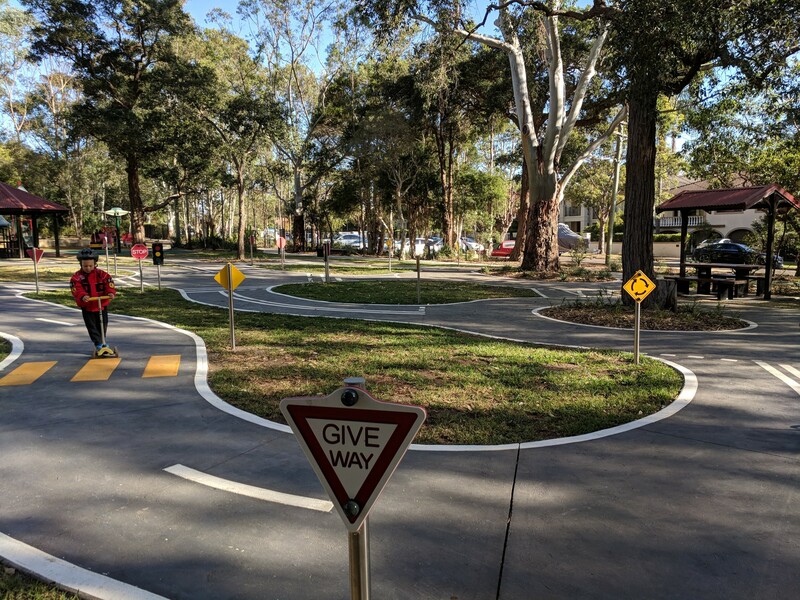 On the Chalmers Road side, there’s a new dinky track – a purpose built track for kids to ride on that mimics the road. This is probably our favourite scooter track at the moment! It has roundabouts, traffic lights, parking bays, zebra crossing and is pretty large. 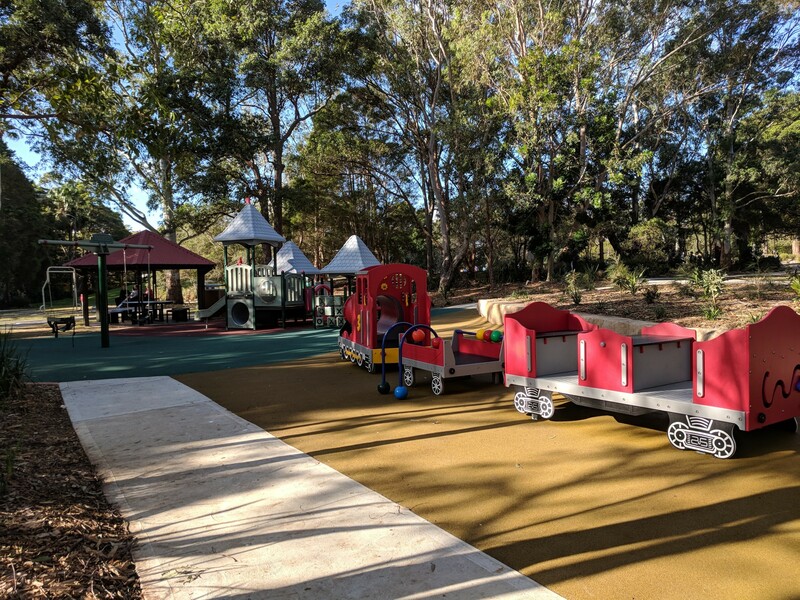 Plus, there’s natural over the track and seating around the track for parents. 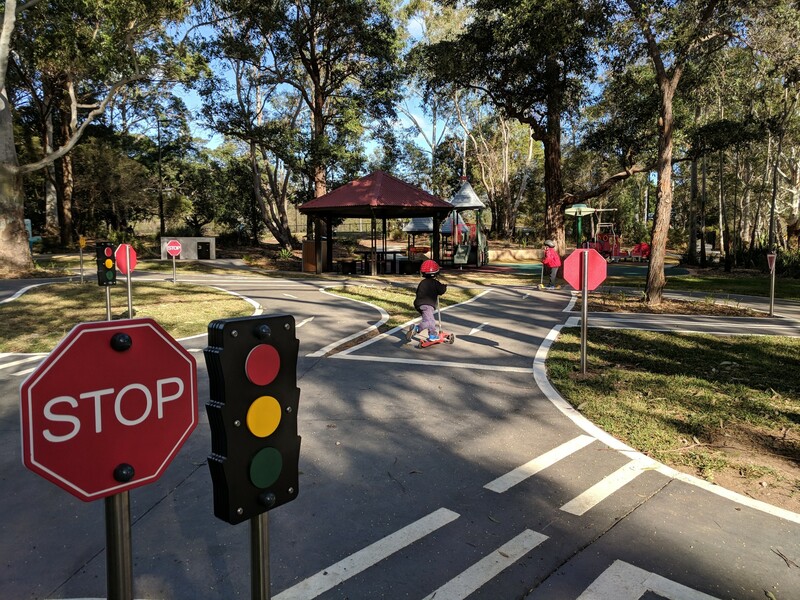 The road signs are low and a perfect height for young kids. 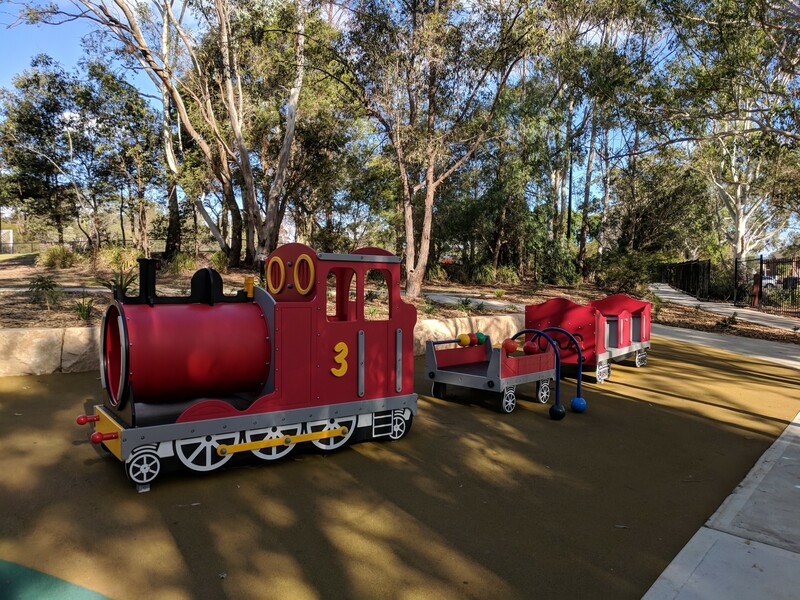 Next to the scooter track is a small playground with a train, climbing play gym and swings. It also has a good amount of natural shade in the afternoon. 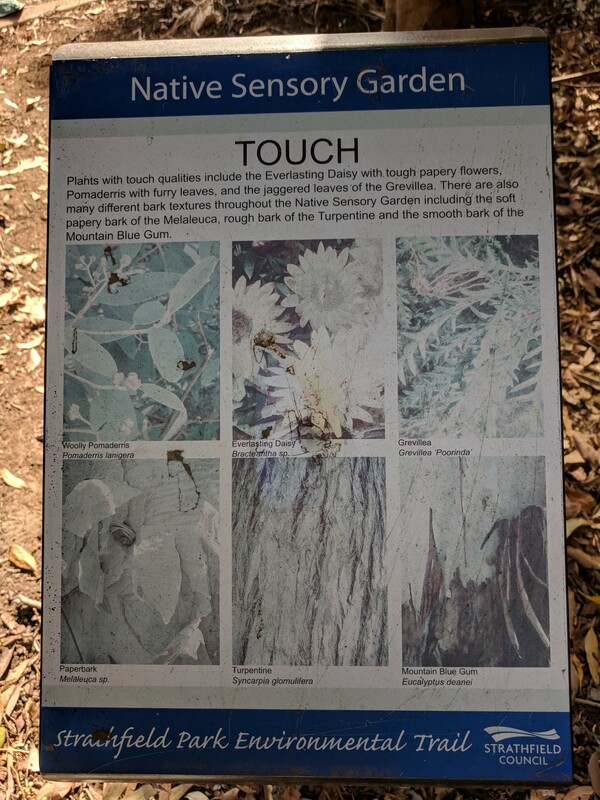 Between the road and the scooter track/ playground, is a native sensory garden to explore and enjoy. 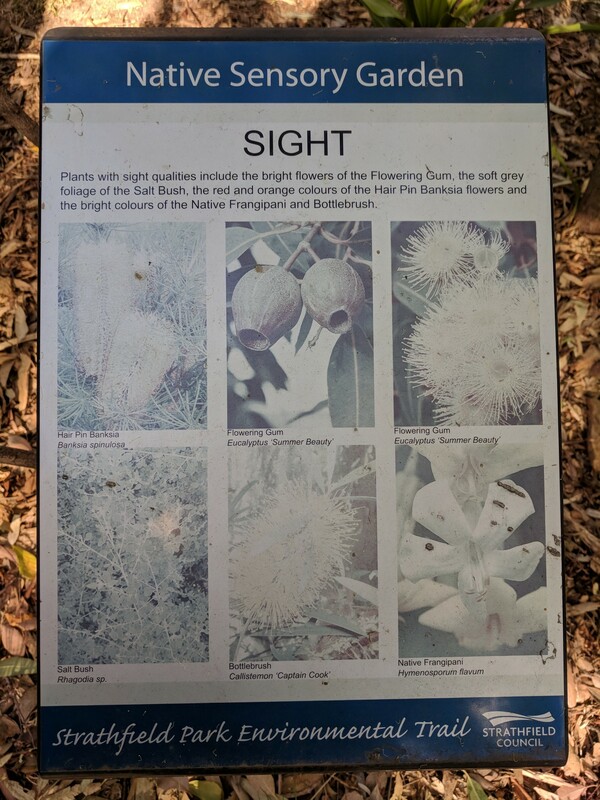 And there are signs to help you identify what is in the garden. 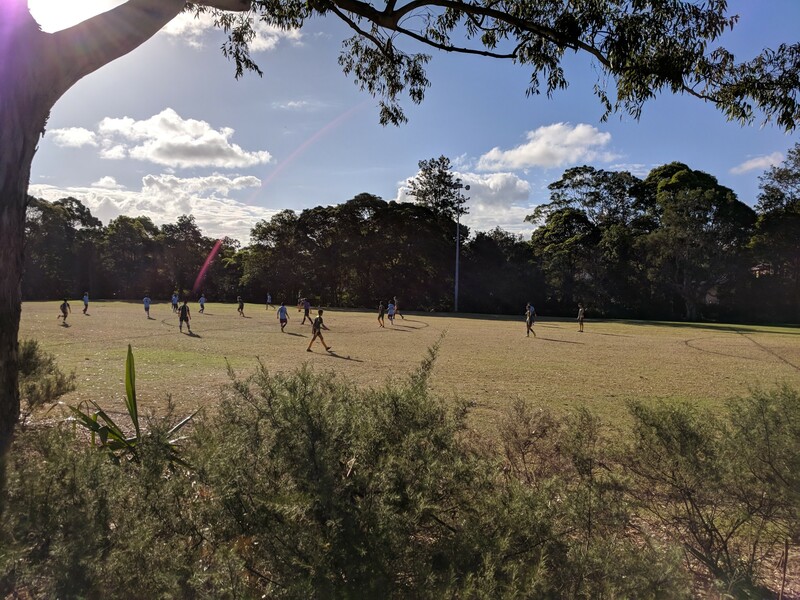 There are also some BBQs, picnic shelters and park benches on this side of Strathfield Park. 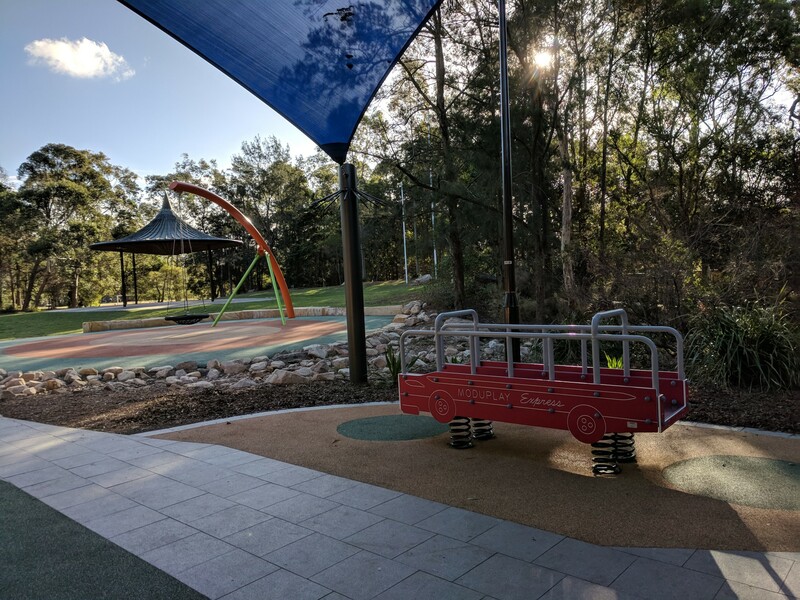 From behind the scooter/ bike track, there is a path that goes in between two sports fields (including a new synthetic one) and takes you over to the playground on the Homebush Road side. 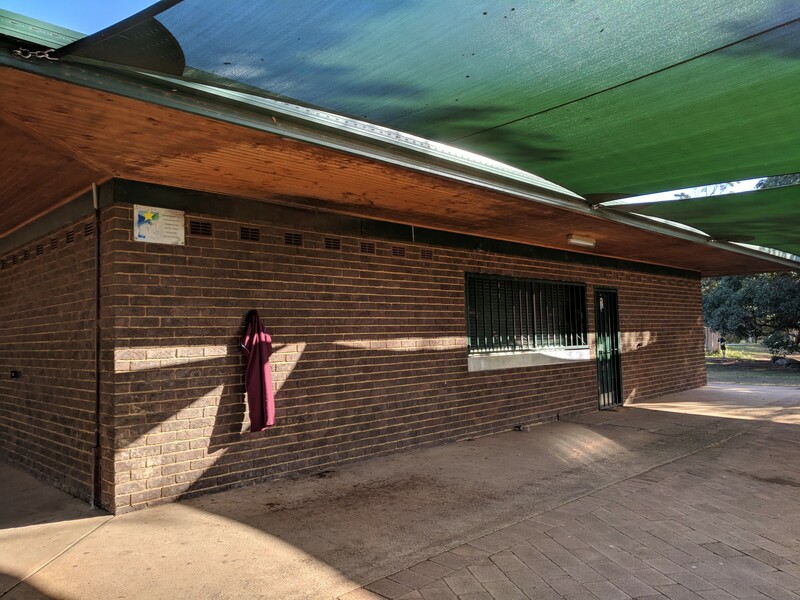 About midway, there is a toilet block. Unfortunately we didn’t notice a baby change table there. 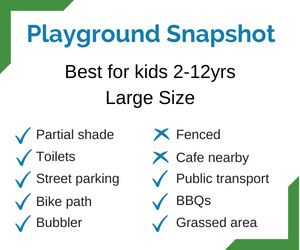 This is where you will find most of the action and one very large playground, divided into about 6 areas! 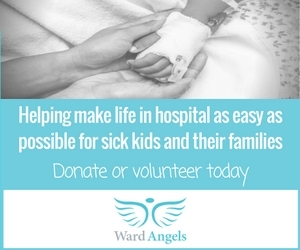 There is flying, sliding, climbing, music, nature based play, a maze, spinning and cubby houses to play in. 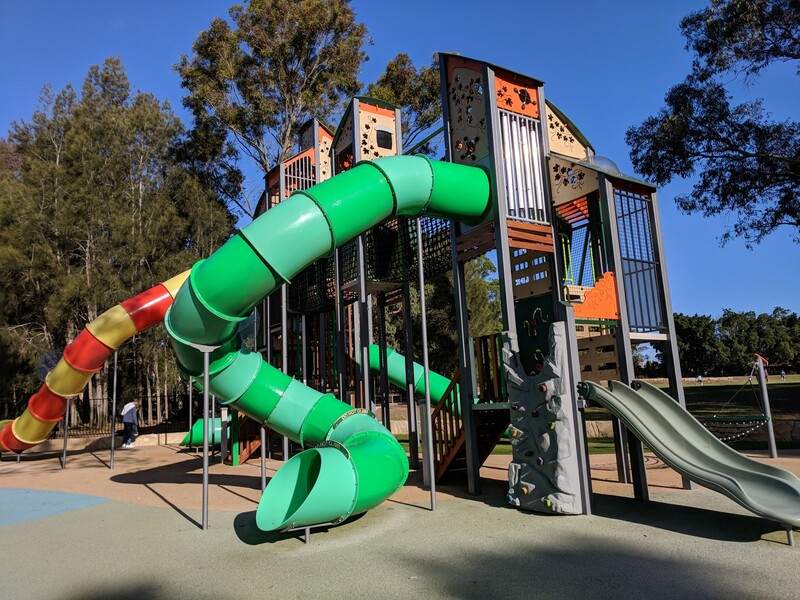 It’s hard to miss the four BIG, colourful slides in the one tower at the back of the playground. They are enclosed and plastic and get some natural shade in the morning and afternoon. 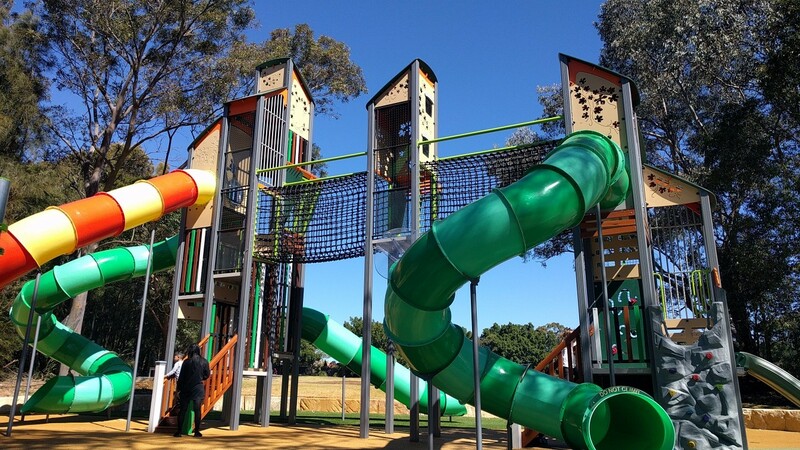 Within the slide tower, there is also a rope bridge, some smaller slides, climbing wall and hammock. Next to the slides, is a climbing area. 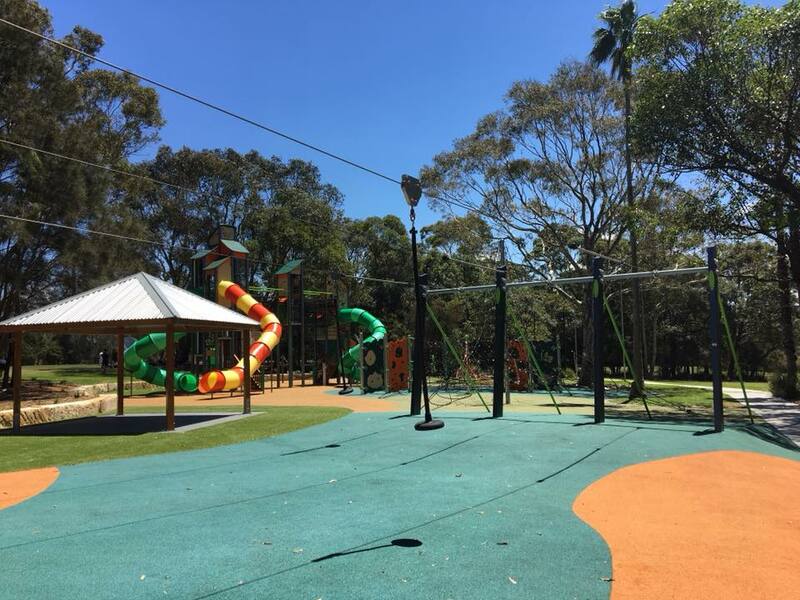 There is a rope spider tower and climbing frame with lots of different climbing challenges. 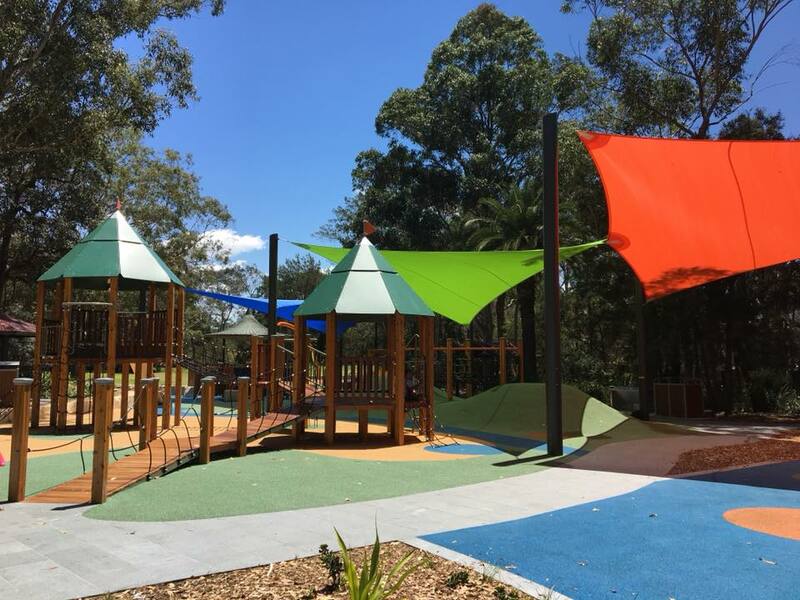 Tucked in next to the flying foxes is a lovely nature based and musical play area. 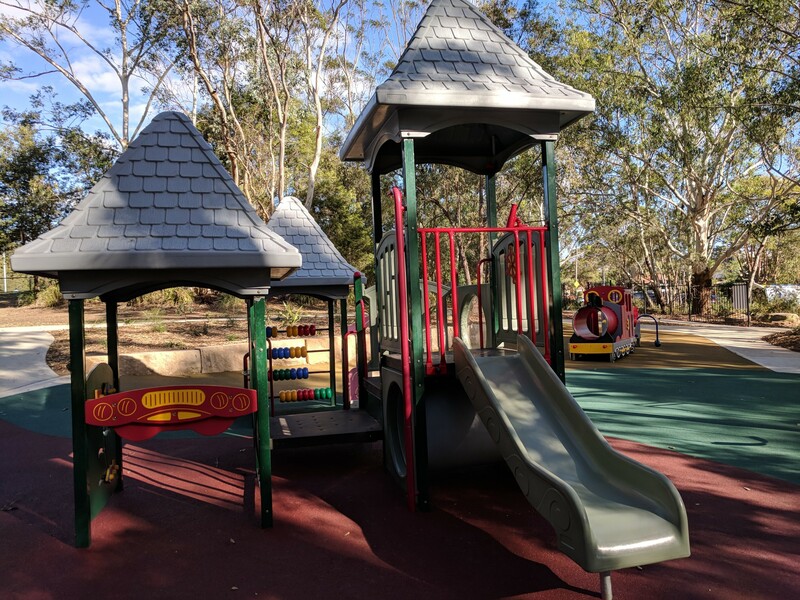 There are wooden teepees to play in, a big drum to bang on, large xylophone to play, stepping pads, pipes to talk to each other and a giant lizard. 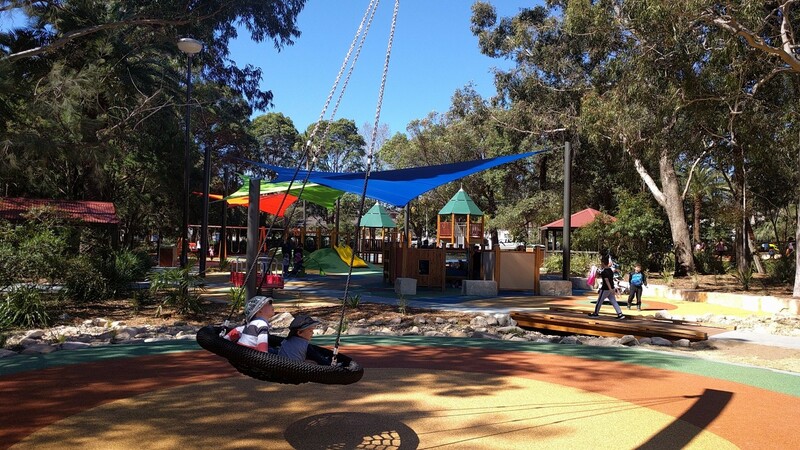 At one of the entrances to Strathfield Park from Homebush Road, you will find a swing area. 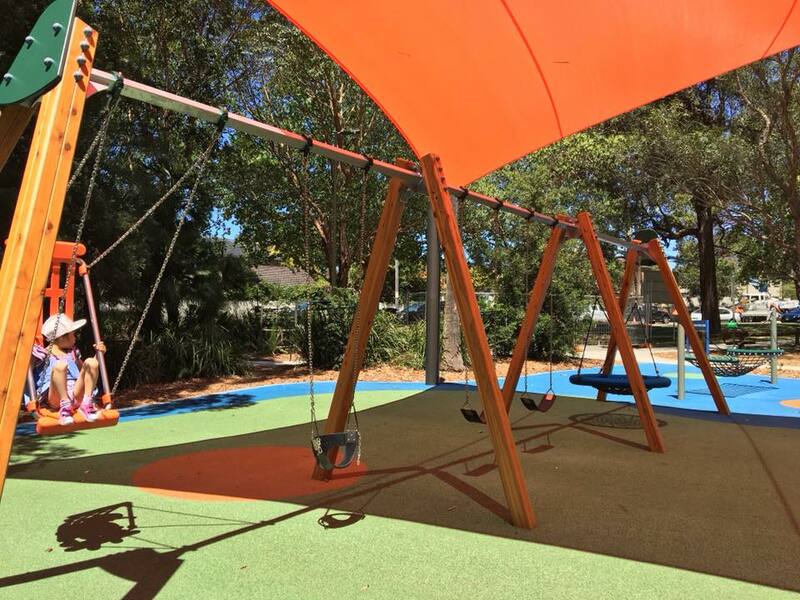 There’s a hammock, birds nest swing and four other swings. 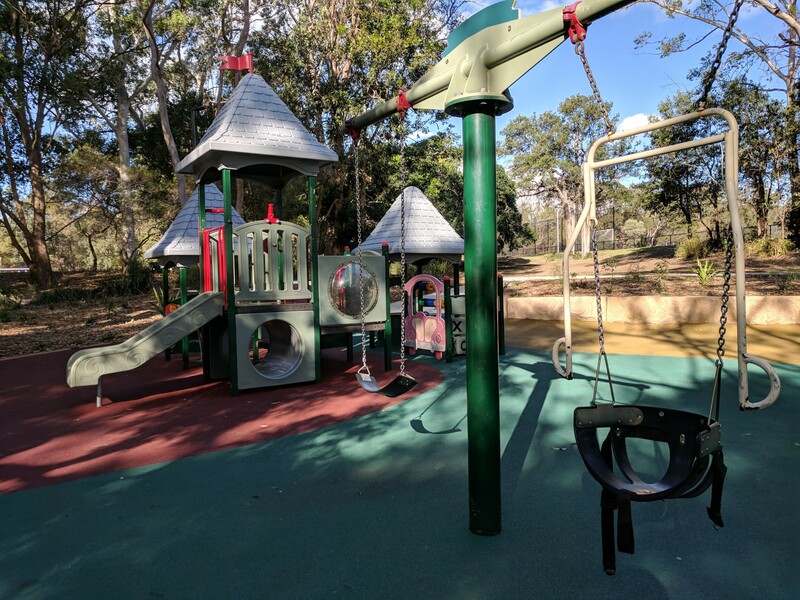 The swings are also near to the nature based play area and shaded toddler area. 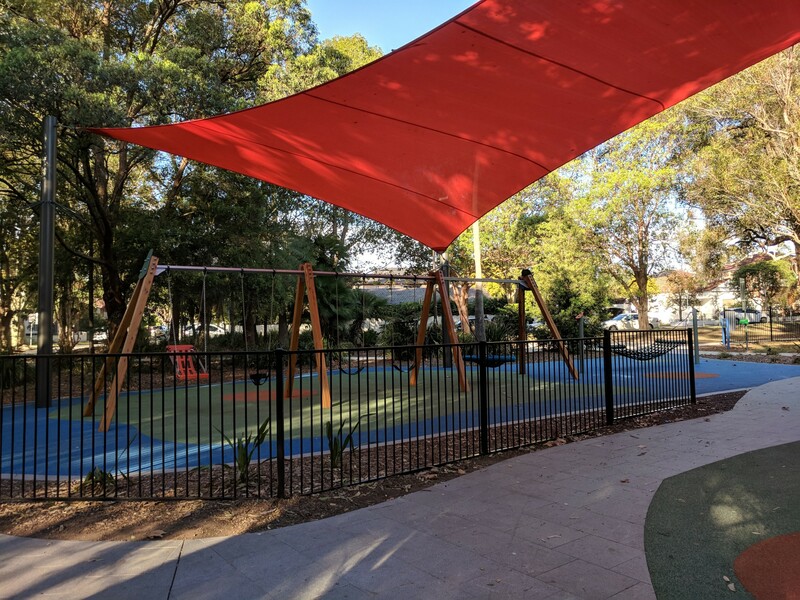 One the main areas at the Strathfield Park playground is the shaded toddler area. There are cubby houses (with ramps), mounds to run/ crawl up and slide down, a maze, two merry-go-rounds and a fire truck. 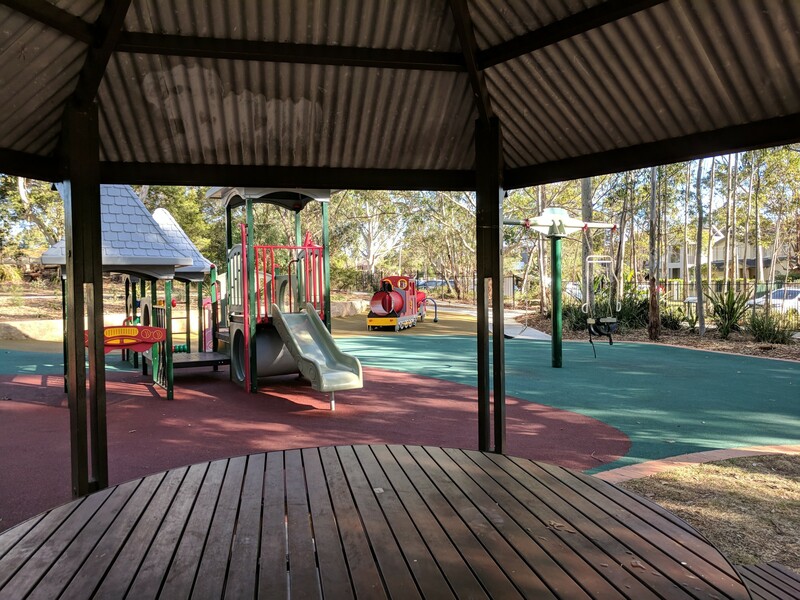 You will also find some accessible BBQs here, with a great view of the toddler play area. 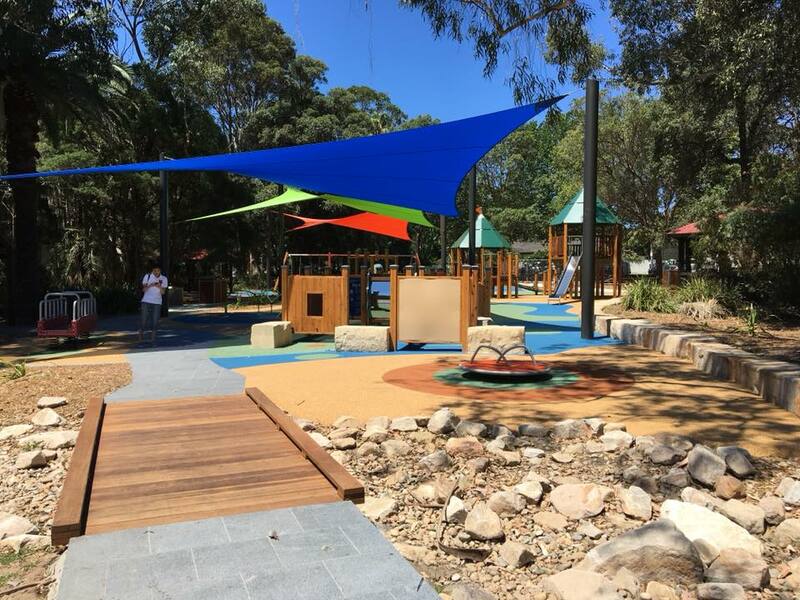 The final area in this fab, large playground has a large birds nest pendulum swing and a dry river bed. Plus an open grassed area and rotunda next to it. 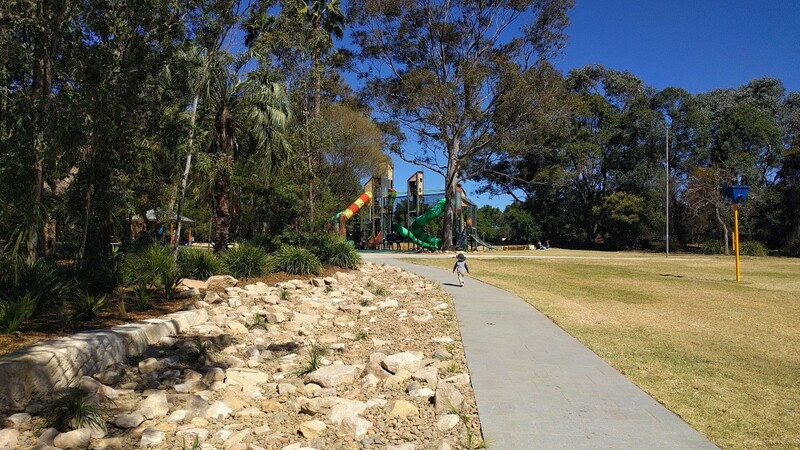 There is SO much packed into this large park, which of course makes it a VERY popular park. 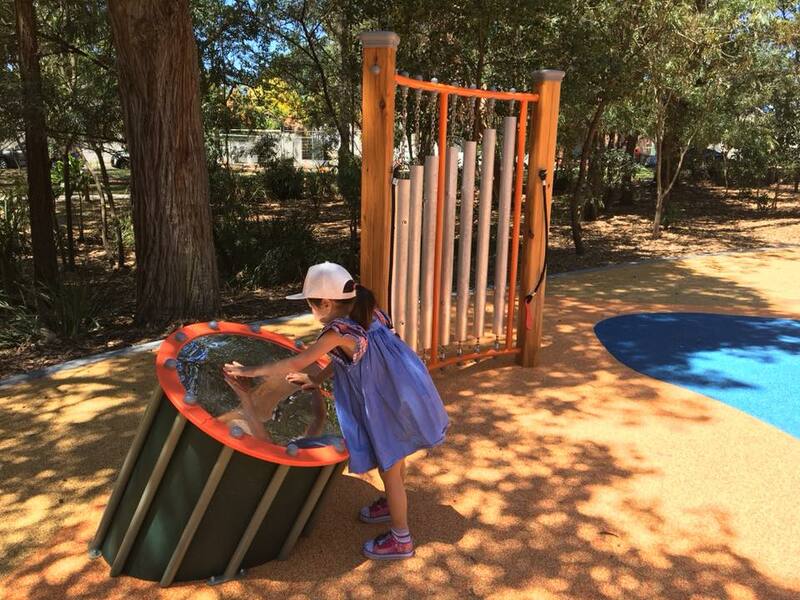 And also a bit challenging if your little ones want to play in different areas! Keep in mind that there is no fencing along the roads. But there is some landscaping to create a small barrier. 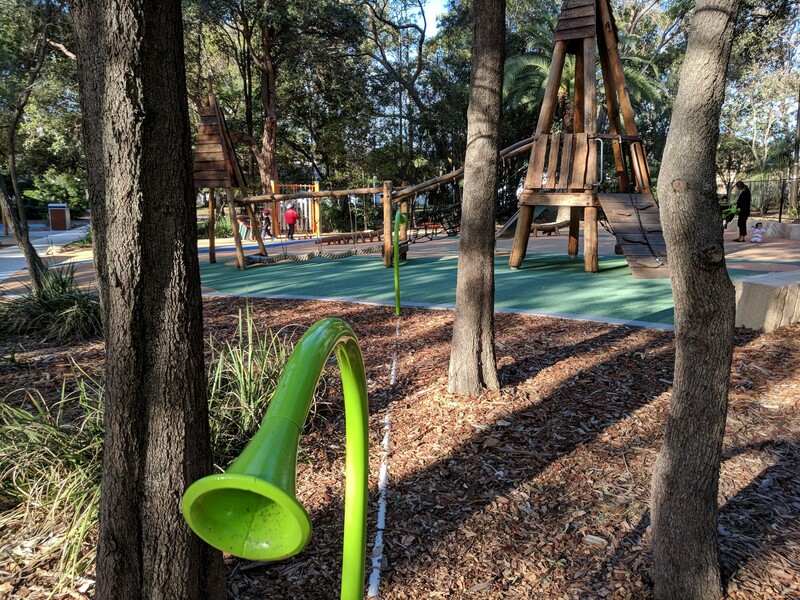 There are now also fences in between some of the play areas to stop little ones just wandering into say a swing. 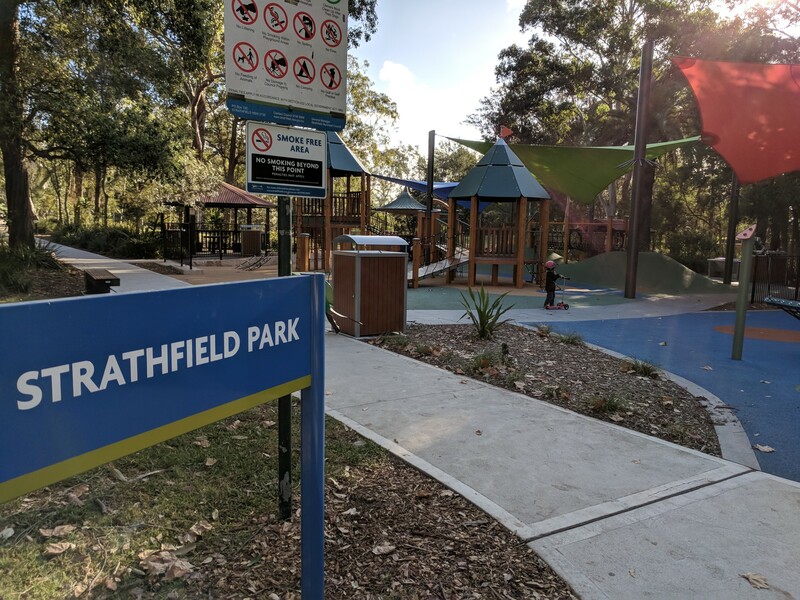 Strathfield Park is about 15km south-east of Parramatta and not far from Sydney Olympic Park. 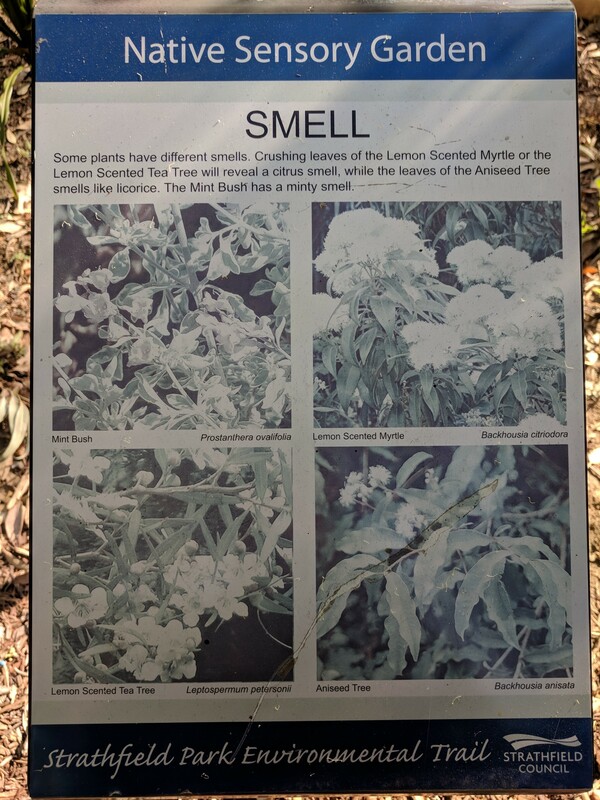 It’s the oldest public park in the Strathfield Municipality and sits between Chalmers and Homebush Roads. There is more parking on Chalmers Road. And this is the side where you will find the scooter/ bike track and sports fields. 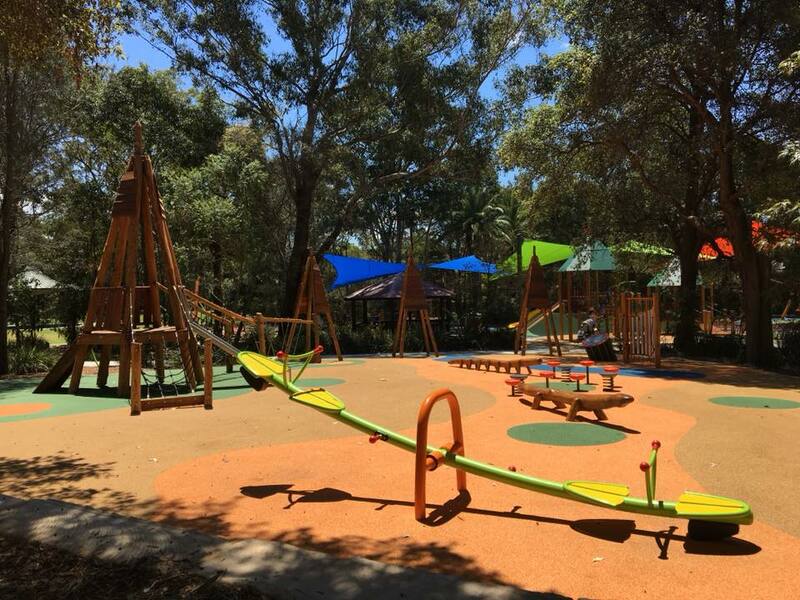 The playground is most directly accessed from Homebush Road where there is just street parking. 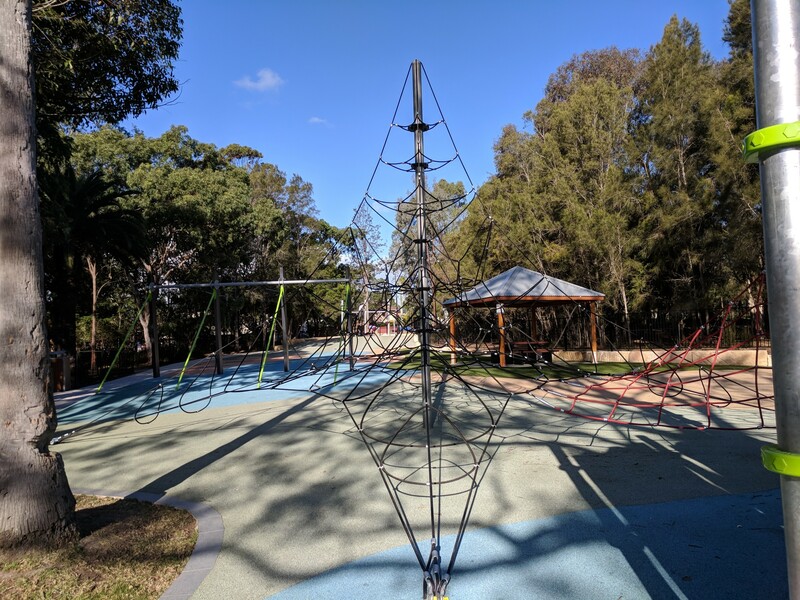 The park is about 2km from Strathfield train station and buses run along Homebush Road and Wallis Ave from the train station and city.